Get ready for an after-dark undersea adventure! The Florida Aquarium will be open late during Summer Fun Nights! Every Thursday from June 20-August 8, the Aquarium will be open until 8p.m. and admission will be discounted to just $15! That means spend less, and get more! More time to stroll along the expanded Wetlands Trail, touch stingrays at the all-new Stingray Beach and see a live performance by the famous Mermaids! Kids can bring a swimsuit and splash around at Explore a Shore before the whole family rounds out the night with a bite to eat at Café Ray or the Caribbean Cantina, both of which will be serving dinner. 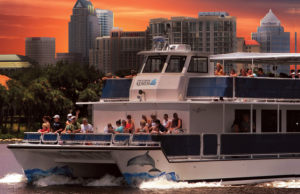 The Florida Aquarium’s Wild Dolphin Boat Cruise will also be available after-dark, departing each Thursday of Summer Fun Nights at 6:30 p.m. Discounted price applies after 4p.m. Located at 701 Channelside Drive, Tampa. 813.273.4000. Stay tuned for more ways to unlock Tampa Bay during Summer nights!